Featuring the Star of Lifetime Television's "Pitch Slapped"
Appearances with The Roots, Adam Young of Owl City, Randy Jackson of American Idol, Third Eye Blind, and more! Blue Jupiter's all-vocal performance is nothing short of explosive! The world-touring a cappella quartet has been described as “the real deal” by rock legend, Gene Simmons; “Incredible!” by Jane Pauly from NBC; “nothing short of magic” by the Sands Casino Entertainment Department, and “simply the best music act we’ve ever had at our schools” by the Connecticut Public Schools Board. 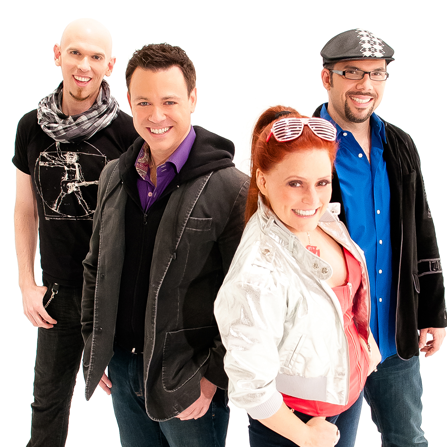 Blue Jupiter’s energetic blend of pop lead vocals, jazzy a cappella harmony and funky beatbox has garnered standing ovations in over 40 states and around the world. Blue Jupiter first gained national fame as the voices of Oreo Cookie, singing the commercial since 2005. Since then, Blue Jupiter has worked with American Idol Judge Randy Jackson, Livingston Taylor and performed on Oprah and VH1's Save the Music. They have performed over 200 shows in China and Japan, voted "Audience Favorite" multiple times at the Harmony Sweepstakes and appeared at countless NACA Showcases during their 15+ year career. The rest of the night was amazing and Blue Jupiter killed it as always!